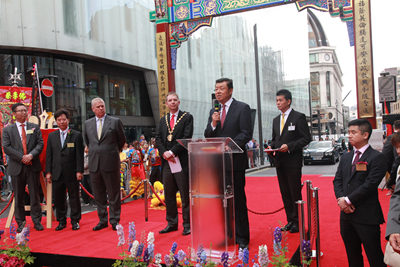 On 25 July, Ambassador Liu Xiaoming attended the ceremony to celebrate the completion of the new Chinese Gate in London Chinatown. 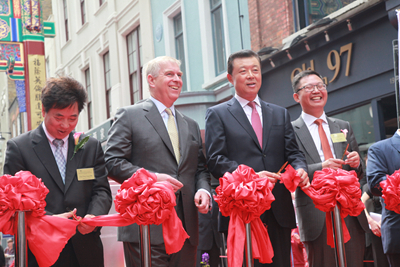 HRH The Duke of York, Lord Mayor of Westminster Councillor Steve Summers, Chairman of London Chinatown Chinese Association (LCCA) Chu Ting Tang, and more than 150 guests from various circles in the UK, main British sponsors and representatives of the Chinese community attended the ceremony. Ambassador Liu delivered a speech at the ceremony. He said that the gate, typical of many found across China, reflected a highly unique Chinese architecture, with rich details and cultural symbols. This brand new magnificent Chinese gate was undoubtedly a new landmark in London's Chinatown. It was more than an architecture with Chinese features, but a monument to the unity and indomitable spirit of the Chinese community in the UK, as well as a symbol of their hospitality and kindness. It would also be a reflection of their perseverance, hard work and social commitment, and would stand for their aspiration for harmony, peace and prosperity - not only in London Chinatown - but also for all the Chinese communities across Britain. Ambassador Liu pointed out that this gate would also be a symbol of China-UK friendship: The construction of the gate was symbolic of the collaboration of the two nations. It had the assistance and support of relevant Chinese and British authorities, including China's Overseas Chinese Affairs Office of the State Council and the government of London and Westminster. The presence of HRH The Duke of York to witness this event showed that both countries attached great importance to the bilateral relations. Ambassador Liu noted that during President Xi Jinping's "Super State Visit" to Britain last October, the two countries agreed to build a global comprehensive strategic partnership for the 21st century. The visit opened the "Golden Era" of China-UK bilateral relations. Exchanges and cooperation between China and the UK had been flourishing in political, economic, cultural and many other fields. The momentum in China-UK relations would remain strong and unaffected by the UK's referendum to leave the EU or the change of the British government. HRH The Duke of York said that it was an honor to attend the inauguration ceremony for the new Chinese gate and extended his welcome to the Chinese who regarded the UK as their home. 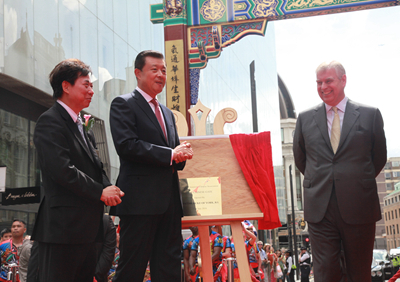 He praised the new Chinese gate as an important symbol of development of UK-China friendly relations. Lord Mayor of Westminster Councillor Steve Summers expressed appreciation for LCCA's contributions to Chinatown, and said he was pleased that owing to the support of five consecutive predecessors and the efforts of the Chinese community, the new Chinese gate was finally completed. He stated that the Westminster government would continue to support the development of Chinatown and expect to witness its continued growth, attracting more visitors for sight-seeing, shopping and entertainment. LCCA Chairman Chu Ting Tang said in his speech that the completion of the new Chinese gate was a testimony to the cultural diversity of London as well as being a symbol of closer China-UK relations. The new gate would not only attract more tourists to Chinatown in London, but also contribute to cultural exchange and mutual learning between China and the UK. The new Chinese gate is located in Wardour Street, London Chinatown. Its construction was initiated by LCCA, and received wide support from the government authorities in China and the UK and the Chinese community in the UK. China Taiping and other Chinese enterprises provided funding for the new gate.